Posted by stgeorgeoma in Saints, Uncategorized. SS. Boris and Gleb, Passion-bearers (2nd) – Boris and Gleb were the sons of the great Prince Vladimir, the baptizer of the Russian people. Until his baptism, Vladimir had numerous wives and many children by them. Boris and Gleb were brothers of the same mother. Before his death Vladimir divided up the State among all of his sons. But, Svyatpolk his eldest son, the Prince of Kiev, also desired to usurp the portions intended for Boris and Gleb. That is why he dispatched men to murder Boris who was in one place and to murder Gleb who was in another place. Both brothers were exceptionally pious and, in all things, pleasing to God. They encountered death with prayer and the uplifting of their hearts to God. Their bodies remained uncorrupt and fragrant. Boris and Gleb were buried in Vishgorod where, even today, a blessed power comes from their bodies, which heals men from various diseases and sufferings. St. Barbarus the Soldier (6th) – Barbarus was a soldier during the reign of Julian the Apostate. When the emperor’s commander Bacchus led the Roman army against the Franks, Barbarus, who was secretly a Christian, was serving in the army. In battle there appeared a certain hero on the side of the Franks, similar to Goliath of old and he challenged the Romans to send one of their men to come out to do battle. Commander Bacchus advised Barbarus to go. Barbarus prayed in his heart to the Living Lord, went out and defeated that giant. As a result, the Frankish army became confused and fled. Then the commander prepared a great celebration and ordered that sacrifices be offered to the idols. During the sacrificial offerings, the commander learned that Barbarus kept himself apart. When he was asked about that, Barbarus declared that he is a Christian. The commander informed the emperor and the emperor ordered that Barbarus be subjected to the most severe tortures. But Barbarus endured all with rare courage and composure. During his tortures, many miracles were manifested and many soldiers, witnessing this, accepted the Faith of Christ. Among them was the Commander Bacchus along with Callimachus and Dionysius. All three were beheaded for the Name of Christ and, after them, Barbarus was also beheaded in the year 362 A.D. Their souls took up habitation in the kingdom of Christ the Immortal King. 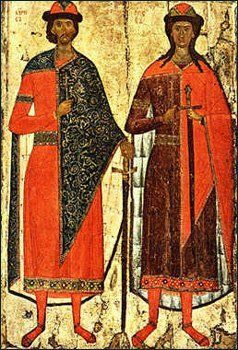 St. Alexander Nevsky (23rd) – Alexander Yaroslavich was born around 1220 at Pereslavl Zalessky (150km NE of Moscow) and was the second of three sons of Yaroslav Vsevolodovich, the devout orthodox Grand Prince of the medieval Russian state of Vladimir. The noble family into which he was born contributed greatly to the fiefdom they controlled, with the local cathedral and monastery being well supported. A simple chapel was also connected to their lakeside home by a wooden arcade and this environment was destined to influence Alexander’s path through life. In 1236 when Alexander’s father moved up the nation’s hierarchy to become Grand Prince of Kiev, Alexander took over as Fief of Novgorod. This was in essence a military commission. From the relatively tender age of 16 yrs, he ruled over this feudal republic with a divine sense of fairness taken from his pious Christian roots and his daily reading of the Testaments. Alexander’s direct reign over this troubled area lasted until 1252 when he succeeded his brother Andrew as Prince of Vladimir, although he continued to control justice in Novgorod through his son, Vassily. In 1255 Alexander took up arms again to quell a rebellion against Vassily. It was particularly as an unselfish defender of the material and spiritual inheritance for his country and its people, that has rendered his name immortal, plus his victorious resistance to the Swedes, Lithuanians and Teutonic Knights. His victorious battle against the invading Swedish army on the banks of the Neva river at its junction with the Izhora, earned him the nickname of Nevsky (meaning of the Neva), which became the name history remembers him by. It is recorded that moments before his demise in 1263 Alexander gave up his princely rank and donned the habit of a monk. Five centuries after his death, following Peter the Great’s own victory against the Swedes, Peter arranged for St. Alexander’s remains to be transported to his new capital of St. Petersburg where they lie today, in the monastery that bears his name. Shortly after the death of Peter the Great in 1725, his wife Catherine I of Russia instituted the Order of Alexander Nevsky. Although abolished in 1917, it was revived by the Soviet government in 1942. 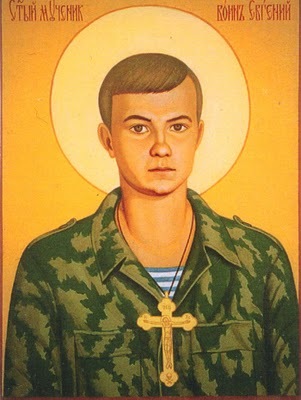 St. Evgeni (Rodionov) the Soldier-martyr (23rd) – When he was 11 years old, Yevgeny Rodionov received from his grandmother a little cross on a chain. He wanted to wear it to school, but his mother, a devout atheist, warned him against it, since the communist authorities frowned on such things. Yevgeny wore it anyway and refused to ever take it off. When Yevgeny grew, up he enlisted as a soldier in the Russian army. When he was 19, he was violently taken hostage by Muslim Chechen rebels. They kept him hanging by his wrists in a basement. He was left days without food and was severely beaten. He did not take off his cross even at the hardest moment of beastly tortures. Yevgeny’s mother, Lubov, has been able to recover her son’s body to give him a proper burial. After seeing her son’s boots in a shallow grave full of four dead soldiers, she would not believe it was him until she saw his cross still around his neck. She found his head later. Veneration of this Holy Martyr has been spreading and pilgrims are flocking from miles away to venerate his miracle working relics. An Icon that was made of Yevgeny has begun weeping myrrh. Yevgeny’s father died shortly after the return of his son’s body, not being able to live with the torment of loosing his son. 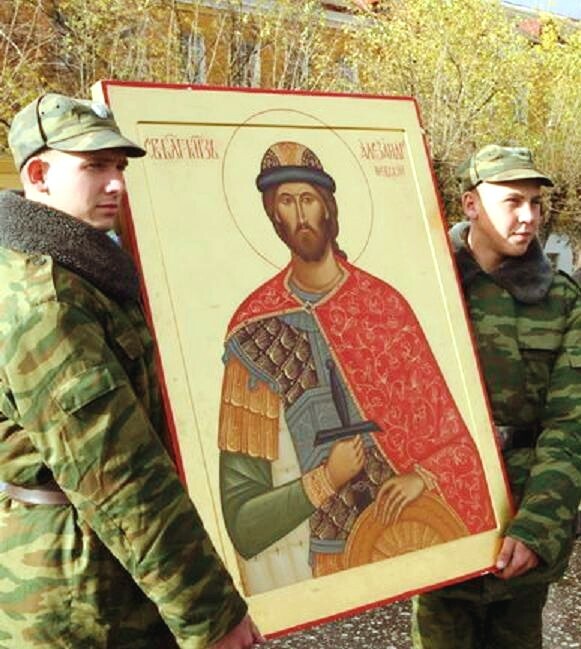 Yevgeny’s mother, who never before set foot in a church, put off the world and is now an Orthodox Christian believer, saved by the example of her son, the Holy Martyr Yevgeny Rodionov.